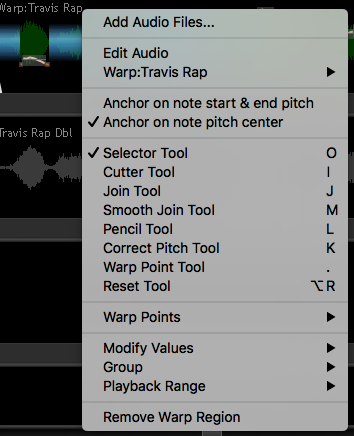 The Warp Region function is one of Revoice Pro's most useful tools for making creative and/or corrective time and pitch adjustments "in place" (i.e. the output is directly created in the same track as the input, so the input is replaced by the desired output). This corrected audio can then be used both on its own and as an input to other Revoice Pro processes such as APT or Doubler processes. Adjustments made to a Warp Region will also cause tracks that use this signal as an input to reprocess the output to follow the time and pitch changes in the changed input (if the process is set to do that). In one track, select one (or multiple audio waveform regions in the same track) as shown in light green at the right. 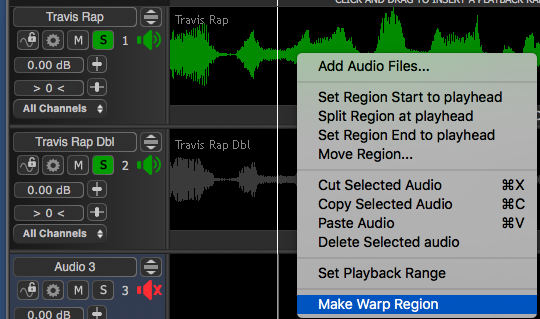 RIGHT CLICK in the track with the selected regions and select Make Warp Region in the pop-up menu window that will appear (shown right). Once the region (or regions) have been processed, there will be Warp Region end markers (white triangles) at the ends of each warped region, blue "non-pitched" markers (in centre of waveform), and pitch contours may appear as shown below in light lines with note-height blocks (notes) around them. RIGHT CLICK in the track concerned to see the the menu below. You will see the available Warp functions, which in this example is just one, Warp:Travis Rap. Although normally the editing choice is set correctly, if required, select the name of the Warp function then one of Edit Time & Pitch, Edit Level or Edit Pitch Limits to display that Warp Region's editable features. If there are multiple warp regions listed, only one can be selected at a time from the left hand part of the menu. To Remove the processing in a Warp Region, RIGHT CLICK in the region which has the Warp Region and select Remove Warp Region as shown selected at the bottom of the menu shown right. To see and change the Settings for each Warp Region, select the Warp Region of interest and then either press the P key, or RIGHT CLICK the Warp Region and select Settings from the sub-menu related to the Warp process concerned, and the Warp Control Panel should appear.